Confederations Cup will be held from the 17th of June to the 2nd of July in Russia. It’s football tournament between national teams. The teams are divided into two groups: Group A and Group B. 0 – minimum quantity of scored goals in the match (Spain-Italy). 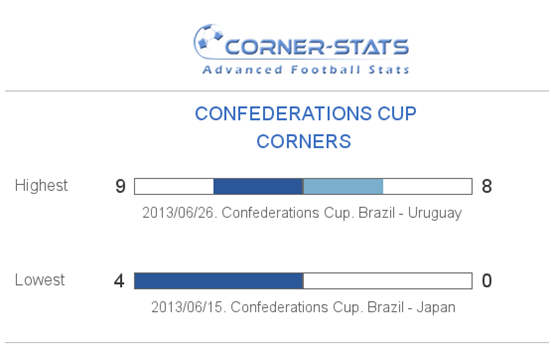 4 – minimum quantity of corners per match (Brazil – Japan). 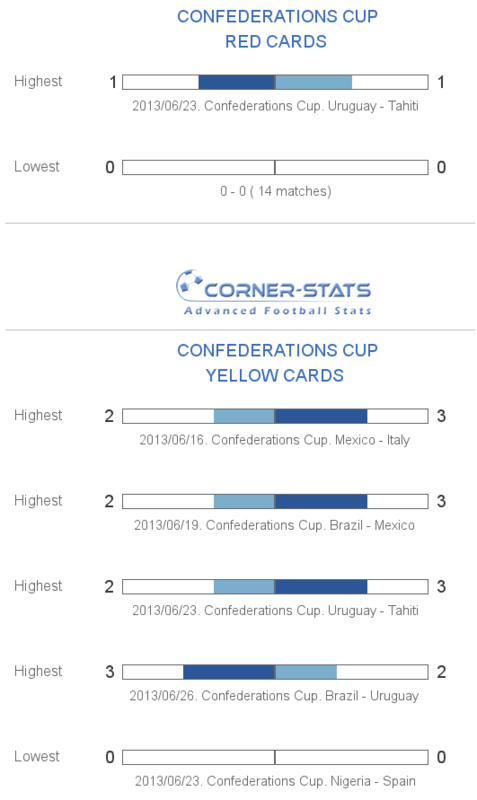 5 – Maximum quantity of yellow cards per the match ( Mexico – Italy, Brazil – Mexico, Uruguay – Tahiti, Brazil – Uruguay). 2 – Maximum quantity of red cards per match that a referee showed in the match – Uruguay – Tahiti). We see that if to compare the results of these 10 matches, Germany, Portugal, New Zealand and one of two teams – Australia and Cameroon will play in the quarterfinal. But don’t rule out other teams, especially national team of Russia, counting to attention a well-known fact that the team plays better at home. Of course, this data is not correctly reflected future matches (because teams played with different on strength opponents) that’s why such analytics can be considered as the first step towards estimating upcoming matches. More correct information about some specific upcoming match you can find on https://corner-stats.com on the page of the match in section of similar matches (matches of teams with opponents approximately equal by strength to current one). As you can see on individual total corners the leader is Germany that takes on average 8.3 corners per match. 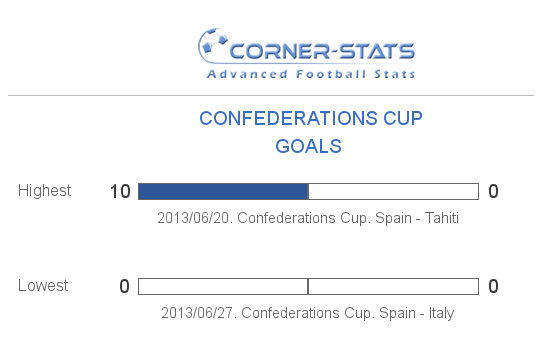 The second is Australia (7.6 corners per match) and the third is Portugal with the indicator of 7.0 corners per match. These three teams are completely leaders with a huge gap with the rest participants of the tournament. And Mexico is the leader on being taken corners by opponents. 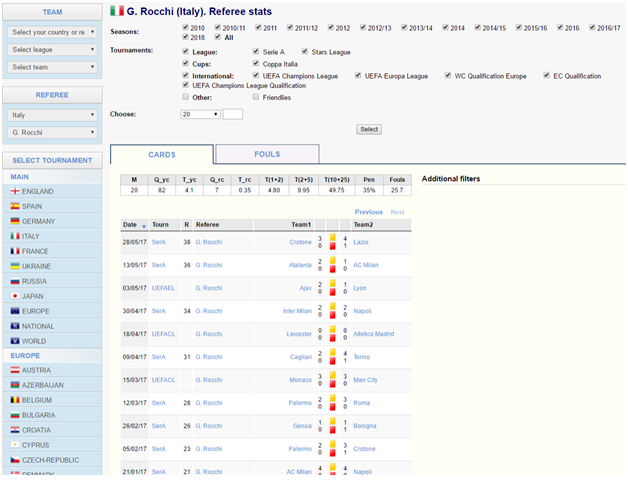 the third is Mexico (16 yellow cards + 1 red ones). The most peaceful team in this group is Germany (10 yellow cards + 0 red ones) and Russia (11 yellow cards + 0 red ones). Pen is the percent of the matches in which a referee awarded a penalty at least once.